One year before the United States-led coalition invaded Iraq, then-UK Prime Minister Tony Blair told the administration of President George W. Bush that he would support military action in that country, according to a memo publicized Sunday by the Daily Mail. The document, written in March 2002 by ex-Secretary of State Colin Powell to Bush, was contained in a batch of secret emails held on the private server of Democratic presidential candidate Hillary Clinton. “On Iraq, Blair will be with us should military operations be necessary,” Powell wrote in a memo penned one week before Blair met Bush at the former president’s ranch in Crawford, Texas. A year later, British Members of Parliament (MPs) gave Parliamentary approval for the invasion of Iraq. Former Labour MP Andrew MacKinlay, who sat on the foreign affairs select committee in the run-up to the war, told LBC Radio that he is “ashamed” to have trusted Blair about the Iraq War. “Looking at this these documents this morning and everything else that has gone before we know that this was a complete and utter deceit to me and to others,” he said. 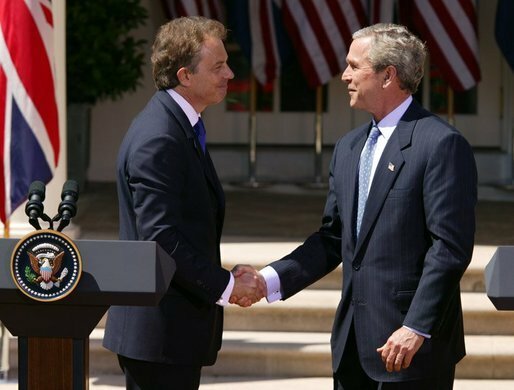 “For George Bush pretending Blair was a player on the world stage to impress voters in the UK when the Americans didn’t even believe it themselves,” he concluded. This entry was posted in Government, International Agreements, Military, National Security vs Police State, Terrorism and tagged Atrocities, George W. Bush. Tony Blair, International Agreements, Iraq, Security, terrorism, United Kingdom on October 20, 2015 by ew.